We learned that like storm chasers, many people can become addicted to chasing the Northern Lights, because they are so unpredictable. The aurora is notoriously very sensitive to location and weather patterns. Ideally, it occurs in areas close to the Arctic Circle during periods with fair skies and complete darkness. We traveled to Fairbanks, Alaska because it is known to have some of the most ideal conditions in the world. 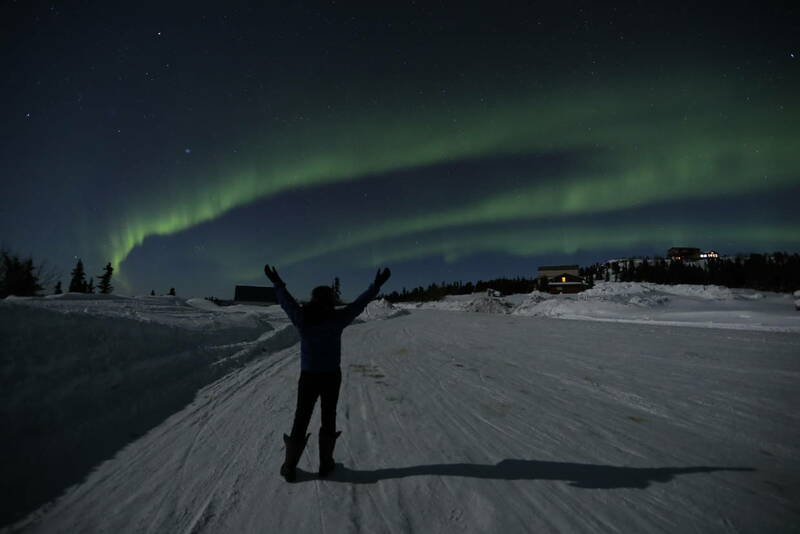 Tourists are reassured that if they stay for three or more days during the high viewing season, there is a very high probability that they will catch the aurora, given that Fairbanks touts that it is visible about 240 days a year. Known as “The Golden Heart of Alaska”, Fairbanks is renowned for the kindness of its people and historically for the discovery of gold. It has a beautifully diverse, active landscape with hot springs, mountains, tundra and the well-known Alaska Pipeline. Located in the northern Alaska, the small city is land locked, so there is less chance for cloudy skies or precipitation that could potentially impede aurora viewing. Experts recommend that the best time to see the Northern Lights in Fairbanks occurs between August 21st to April 21st. Canon held its photography workshop in March, a month with longer days (in December daylight lasts only about three to four hours), a warmer climate and better driving conditions than during the winter months. During our stay the daily temperature hovered around the 30’s, and then at night dropped to about five degrees with a wind chill well below zero. Several technologic innovations were key to making our trip a success. First, we closely monitored the online aurora forecast through the website http://auroraforecast.gi.alaska.edu. This is a service provided by the Fairbanks Geophysical Institute and is updated each day at 3 PM, Alaska time. The site provides an aurora rating between 1 to 10 with a map showing the expected band of activity. Per Canon’s advice we also referred to the website solarham.net, which contains more complex weather data and information on solar storms. During the days that we were in Fairbanks the aurora rating ranged between three and four –predicting a strong chance to see the lights. A bevy of aurora apps are also available including: Aurora Forecast and My Aurora Forecast & Alerts. We learned extensively about the latest advances in photography equipment from the Cannon experts. First, it must be noted that there are differences to what our human eyes can see and what the camera picks up. Brace yourself, as this is one awe inspiring event where you will not see anyone holding up a smartphone because it just does not have the technology to capture the aurora. 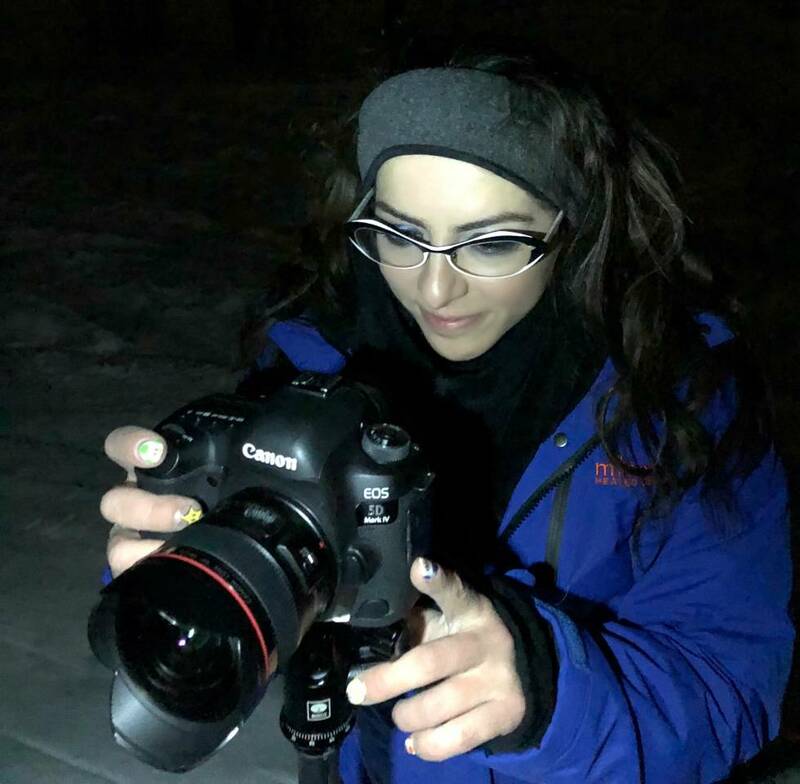 We shot primarily on a Canon DSLR 5D Mark IV with a durable tripod that could withstand the wind and snow. A no fail starter option for camera settings include a 14-24 mm lens (great for a wide angle of capture), an ISO 6400, aperture of 2.8 with a three second shutter speed. A note to budding photographers, when shooting on the DSLR any tiny bit of external light source will drastically change a shot. A car’s headlights, a flashlight and even the LED buttons (on our heated gloves) can greatly impact the photo. Nature provided its own external lighting with a generous half-moon on most nights, an ideal natural light source. Beach dwellers need not apply. The conditions were for extreme adventurers only with wind chills easily hitting twenty degrees below zero. Since we were out observing the lights from around 9pm- 4am, the proper cold weather gear was non-negotiable. If you are not dressed properly, you will have to return to the car to warm up and could potentially miss epic shots. We packed an extensive cache of the latest heated gear including coats, scarves, gloves, and then layered and layered all this clothing until we could barely move. You can see more of Katie’s top gear picks in a video here. Dressed like Ralphie in A Christmas Story, we noted that the older Alaskan locals, known as “sourdoughs,” did not get nearly as geared up as we did. Historically, their tradition is to watch the lights while lying on their backs in the snow, which was hard for us city-dwellers to imagine, as at times we wanted to get pizza delivery and watch through the sunroof. Preparations for viewing the lights started early in the day with plotting locations, packing gear and then feeling the growing anticipation. During our stay in March, the sun set at approximately 8 PM. 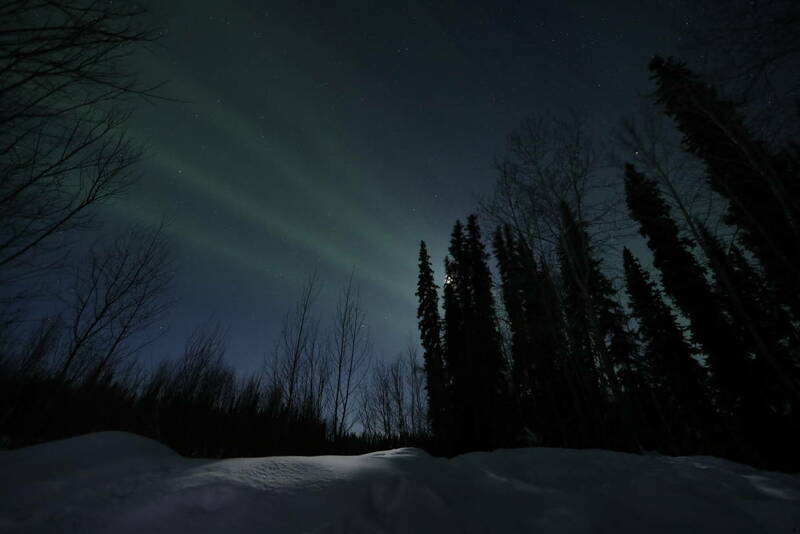 At twilight we began to gather in the hotel lobby, and under the guidance of Sklute, who is an expert in viewing the Northern Lights in Fairbanks, plotted locations ranged from 20 minutes to several hours from the hotel. Once we left the city area, the roads became much more far-reaching and desolate. Fairbanks had experienced above average snowfalls prior to our arrival and there were huge piles of snow lining both sides of the road. Roads had several inches of black ice, and after growing up in Erie, PA we knew that we had to drive slowly, although locals seemed to fly on them like second nature. As we drove, we would periodically see rows of mailboxes clustered along the roadside, but most of the homes were built well off the main highway. This made us feel the full extent of where we were – driving through the sparsely populated Last Frontier with pine trees and rolling hills as far at the eye could see. Most of the viewing destinations were located amidst trail-like roads where an SUV was a must. In these wilderness areas there was absolutely no light pollution. It’s hard not to quickly notice that the sky was completely clear and full of countless stars and constellations. As the night progressed, we would set up our tripods and wait in the car constantly keeping an eye on the skies with anticipation for the aurora. For some reason every night while we were there the auroras came out right around 1 am and stayed strong for hours. It was not uncommon that once the lights appeared those around us would begin to cheer. During nights of lower activity, sometimes the iridescent greenish streaks will remain fixed and subtle. We were lucky that during our trip they progressed and became so incredibly dramatic that the whole night sky seemed to be illuminated. At its most brilliant phase, the aurora became like a curtain of light or an undulating ribbon. At one point it started to “dance” across the sky with angelic prisms of light spanning all colors of the rainbow. We used the Canon C300 to record these beautiful time lapses. It is one thing to see the Northern Lights, but quite another to capture the experience in a photo to bring home. Sklute and his team guided us with recommended settings and camera configurations, but just like learning any skill, it also required extensive practice and adjustments while out in the field. 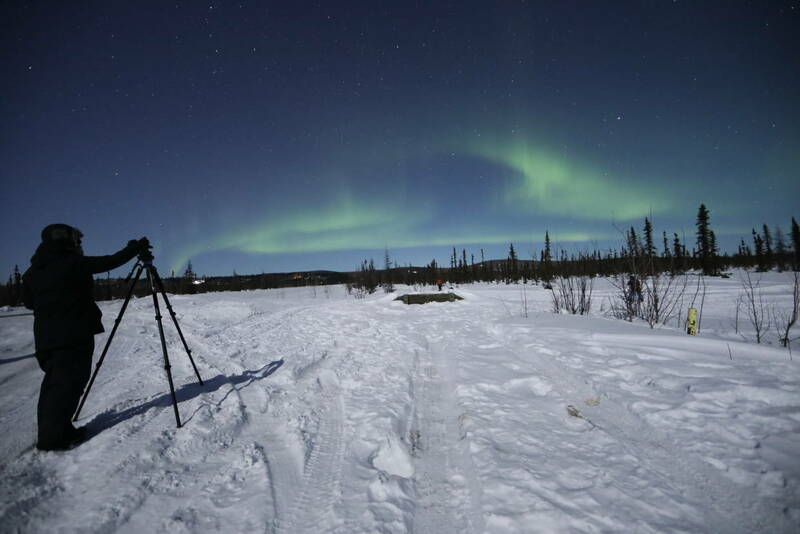 Unlike most of the other photographers onsite, who were interested solely in the landscape, we were keen on getting in the picture with the aurora in the background. It was a challenge to light the foreground of the subject in darkness and then ensure that the facial details were manually focused. We developed a liking to silhouette shots facing the aurora, which are more manageable for output. We just had to remember to remain perfectly still during the three second shutter speed. Since the aurora seemed to be constantly moving, every shot was different. By the end of the Canon workshop, we walked away not having the perfect shot, but shots and can proudly report that they are as nature displayed without any Photoshop post-production. On our last night, Canon expert Eric Stoner provided us a detailed portrait mini workshop using the brightness of the moon and a small flashlight as an external light source to capture this epic photo. If a picture is worth a thousand words, then this one aptly conveys our unforgettable adventure in Fairbanks, Alaska. Photo Courtesy: Eric Stoner – Customer Experience Technical Advisor, Canon U.S.A.
You can find more about Katie and her adventures at www.katielinendoll.com and a full tips and tricks video on capturing the Northern Lights here. You can follow Katie on Twitter, Facebook and Instagram. I have never been to Fairbanks, Alaska in this lifetime. I do like viewing any pictures of the Northern Lights. Love the beautiful colors against the night sky. To me the Northern Lights are AWESOME!!! Honestly, just seeing them (in Norway, last fall) was spectacular enough. At the time, I didn’t care if I was photographing them at all!